So reads the one-liner synopsis for Koo Chia Meng’s Too Far North, a 5-minute non-fiction film that intersperses Singaporean voiceovers with still shots of the Taipei city landscape, and the occasional time-lapse. 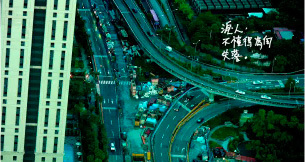 The cinematography is exquisite, as Koo exhibits a sensitivity to framing in his maximization of the use of lines in several stunning frames, one of which an aerial shot of a busy Taipei crossroad that was especially impressionistic to this reviewer. The film’s message is clear and strong without any of the overbearing Total Defence “love your country” overtones that our government bodies seem to be fond of in their collaterals and avdertisements. All in all, this short film was certainly effective in evoking the silver of pride the average cynical Singaporean layperson might have buried deep in the recesses of his heart. “Only you would know where home is”. Well said. This film was nomniated for Best Documentary in the 2nd Singapore Short Film Awards.